Only the Holy Spirit grants true harmony. According to Vatican Radio, Pope Francis highlighted this during his daily morning Mass at Casa Santa Marta, as he reflected on today’s reading from the Acts of the Apostles and observed that one word sums up the lifestyle and sentiments of the very first Christian community: harmony. “We can negotiate some sort of peace … but harmony is an inner grace that only the Holy Spirit can grant,” the Pope said, stressing the first Christian community illustrated this. When a community is united in Christ, the Pontiff underscored, it is courageous. When there is no one wanting, the Argentine Pope noted, this is a sign of harmony. The fact that the first Christian community freely gave their own goods “so that others would not be in need” evidenced its harmony. While drawing from the day’s reading of Barnabas’ virtuous example of selling his field and giving his proceeds to the Apostles, Francis offered a contrast by citing another passage from Acts which recounts the story of Ananias and Sapphira who after selling their field, pretended to give the proceeds to the Apostles while keeping it for themselves. The Pope pointed out how the lie cost them dearly as the both died on the spot. God and money, Francis stressed, are two “irreconcilable” masters. 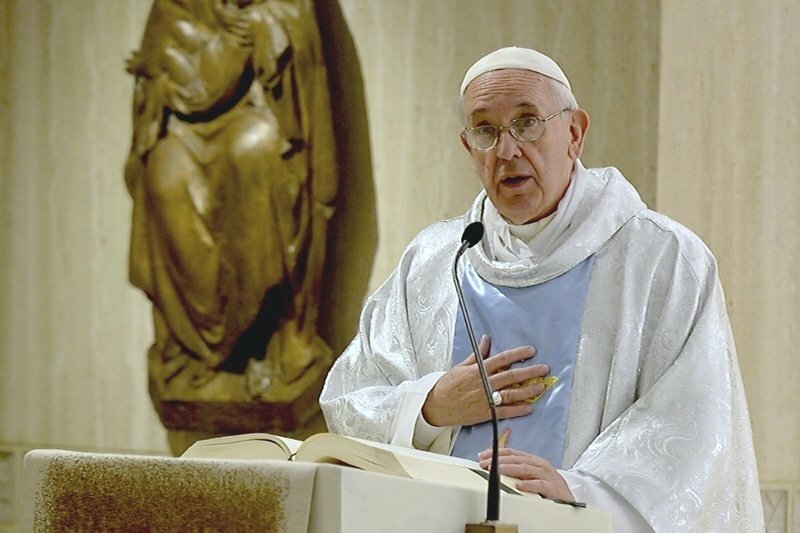 Warning against confusing “harmony” with “tranquility,” the Pope stressed that a community can seem tranquil, but it is not necessarily harmonious. The Holy Father went on to encourage a re-reading of the Acts of the Apostles and their portrayal of the first Christians and their life together, noting we should look to them as examples of how to bear witness in our daily lives.